I dropped by the Roastery this morning just in time to see Starbucks partner loading the Congo Lake Kivu unroasted coffee into the green coffee loading pit. Patrek is a great partner! He’s an ambitious guy! Just a little over one year ago, I watched him earn his black apron! He’s learned an enormous amount about coffee is a very short period of time. One of my readers on Facebook asked "What happens to the burlap sacks when they're empty?". I believe that they're returned to the Kent Roasting Plant for some sort of recycling program. The reader suggested that the Roastery sell them. In fact, I think that's a creative idea and thinking outside of the box! I know people who would buy empty coffee sacks and considering the wild things for sale at the Roastery (like a bicycle) a coffee sack doesn't seem like an unusual idea. I can easily imagine people buying them as a novelty item or to use them to upcycle into something else, such as a burlap tote bag. 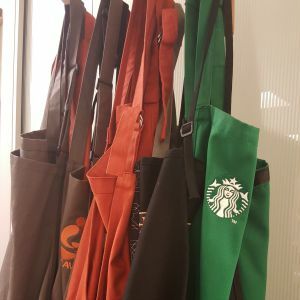 I hope Starbucks listens and offers some burlap coffee sacks for sale at the Roastery! This coffee is also currently on the scoop bar at the Roastery. I bought some to take home. The first thing I found myself doing was huffing the coffee. I don't think I'm alone. I think lots of coffee addicts "huff" their coffee all the time! I'm still working on learning a little bit more about this coffee and might update this article later. Nonetheless, I thought this was an enjoyable adventure with Congo Lake Kivu today. One thing I forgot to do was ask for a close up of the green, unroasted coffee bean. I'll trying to see if I can get a picture of that on another visit at the Roastery. By the way, this is the another offering of Congo Lake Kivu - In September last year, Starbucks offered this coffee as well.